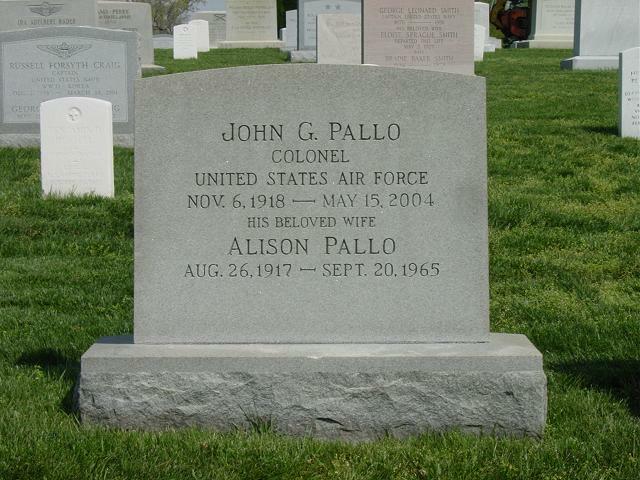 John G. Pallo, 85, a retired Air Force Colonel who served in World War II and the Korean War, died of cancer May 15,2004 at his home in Vienna, Virginia. During World War II, he served with the Army Corps of Engineers' 553rd Combat Engineer Battalion in Britain, constructing airfields and temporary living quarters for incoming U.S. forces. Afterward, the battalion trained intensively in bridge building, demolitions and minefield clearing for the impending invasion of Europe. As a First Lieutenant and company commander, he went ashore with the battalion at Omaha Beach on D-Day. He participated in several major battles of the Western European campaign, including the capture of Cherbourg and the Battle of the Bulge. After receiving a field promotion to Captain, he was assigned to the Corps's European headquarters and helped prepare the engineers for service in the Pacific theater. In 1946, he was part of the 1st Guided Missile Battalion at White Sands Proving Ground in New Mexico. His unit worked with scientists and aerospace engineers constructing gantries and firing captured V-2 rockets and experimental missiles in what would become the beginning of the U.S. space and missile program. A year later, he transferred to the U.S. Air Force when it became a separate service and was assigned to Sandia Base in Albuquerque to attend the Department of Defense Special Weapons School. Having been promoted to Major, he then attended the Air Command and Staff College at Maxwell Air Force Base in Montgomery, Alabama He was assigned to Tactical Air Command headquarters at Langley Air Force Base, Virginia. During the Korean War, he served in a training capacity aboard the aircraft carrier Coral Sea. He later was stationed at Lindsey Air Station, West Germany, and at Norton Air Force Base, California, with the 1002nd Inspector General Group as a Lieutenant Colonel. In 1961, he was promoted to Colonel while assigned to the office of the Secretary of Defense at the Pentagon. From 1964 to 1965, Colonel Pallo spent a year at the Industrial College of the Armed Forces (National Defense College) at Fort McNair in Washington. Afterward, he was an analyst with the Weapons Systems Evaluation Group at the Institute for Defense Analyses in Arlington. After retirement in 1967, Colonel Pallo was general manager of Sanders Associates, an engineering company in Reston. In the early 1970s, he became director of dealer development with the National Tire Dealers & Retreaders Association in Washington. The position entailed setting up trade shows and marketing seminars across North America. He retired in 1982. Colonel Pallo was born and grew up in Yonkers, New York. He studied architecture and engineering at Columbia University until he was drafted into the Army in 1940. He served in the 71st Infantry Regiment of the New York National Guard and attended Officer Candidate School with the Army Corps of Engineers at Fort Belvoir, where he was commissioned a Second Lieutenant in 1942. He was a member of Immanuel Lutheran Church in Alexandria and, since 2000, St. Paul's Lutheran Church in Falls Church. He enjoyed golf and played throughout his life. His first wife, Alison Pallo, died in 1965. Survivors include his wife, whom he married in 1968, Rosalie Miller Pallo of Vienna; and a son from his first marriage, Drew Pallo of Gaithersburg. On Saturday, May 15, 2004 at his residence in Vienna, VA. Beloved husband of Rosalie Pallo; father of Drew Pallo; and uncle of Andrea Lofman. Interment Arlington National Cemetery on Wednesday, June 2, at 2 p.m. Please meet at the Administration Building at 1:30 p.m. In lieu of flowers, memorial contributions may be made to Capitol Hospice or the American Cancer Society.